This service appears to the local network to be a web server, and page requests made to the proxy are forwarded to other servers on the Internet. Most web browsers support the use of web proxies, making it possible to operate your entire network through a single Internet connection. When a user wishes to browse a page not available on the local network, their browser requests the page from Mailtraq. Mailtraq can handle any number of simultaneous connections. 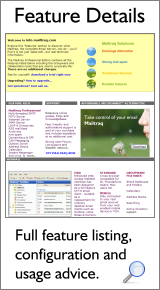 This works in harmony with your mail and news services, so while some are browsing, other users can collect new e-mail. This dialog is accessed via the Edit Outgoing Firewall button on the Proxy tab of the HTTP Service dialog. Mailtraq provides an editable list of URLs and IP address specifications in the Outgoing Proxy Firewall which is specific to each instance of the HTTP Service. This firewall can be configured to deny Web Proxy access to any connecting client or to any range of external URLs for each configured client. An empty firewall permits all connecting clients (which have permission via the relevant HTTP Service firewall) to access all external URLs. "Access to Host Barred: WWW Access to www.domain.com is not permitted." The Web access proxy is available as an optional extra to Mailtraq licenses. Prices are listed here. Please contact us to bundle a Web Proxy with any educational discount you are requesting. The Outgoing Proxy Firewall consists of two columns of data - a Client Machine IP Ranges column and a Valid Web Host Ranges column in which separate web ranges can be held for each IP range.